To claim this profile, please confirm you are Emma Noble. To follow this profile, please let us know your relationship to Emma Noble. Emma's softball stats have been updated for the win vs. Burroughs. The Oaks Christian varsity softball team won Friday's neutral tournament game against Burroughs (Burbank, CA) by a score of 7-3. Emma's softball stats have been updated for the tie vs. Grace Brethren. RESULTTie Varsity softball vs. Grace Brethren. The Oaks Christian varsity softball team tied Friday's neutral tournament game against Grace Brethren (Simi Valley, CA) by a score of 3-3. Emma had 3 photos tagged from the photo gallery "Thousand Oaks @ Oaks." RESULTWin Varsity softball vs. Thousand Oaks. The Oaks Christian varsity softball team won Thursday's home conference game against Thousand Oaks (CA) by a score of 3-0. Emma's softball stats have been updated for the win @ Calabasas. RESULTWin Varsity softball @ Calabasas. 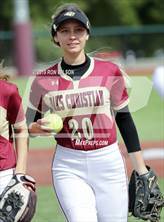 The Oaks Christian varsity softball team won Tuesday's away conference game against Calabasas (CA) by a score of 8-2. Emma's softball stats have been updated for the win vs. Newbury Park. RESULTWin Varsity softball vs. Newbury Park. The Oaks Christian varsity softball team won Thursday's home conference game against Newbury Park (CA) by a score of 1-0. Emma's softball stats have been updated for the win vs. Westlake. The Oaks Christian varsity softball team won Tuesday's home conference game against rival school Westlake (Westlake Village, CA) in extra innings by a score of 4-3. Emma's softball stats have been updated for the win vs. Poly. The Oaks Christian varsity softball team won Saturday's neutral tournament game against Poly (Sun Valley, CA) by a score of 11-3. Emma's softball stats have been updated for the win vs. Chavez. RESULTWin Varsity softball vs. Chavez. 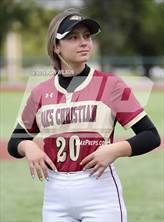 The Oaks Christian varsity softball team won Saturday's neutral tournament game against Chavez (San Fernando, CA) by a score of 10-0. Emma's softball stats have been updated for the win vs. San Fernando. RESULTWin Varsity softball vs. San Fernando. 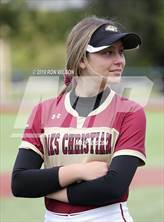 The Oaks Christian varsity softball team won Friday's neutral tournament game against San Fernando (CA) by a score of 5-3. Emma's softball stats have been updated for the win @ Thousand Oaks.